We all know that the Eurail is one of the most convenient ways to travel around Europe, but it can also cost a pretty penny (er, euro). But for the young and adventurous (or even young at heart) there's another option: Busabout, or more specifically, Busabout Explorer, which expanded on the "hop-on, hop-off" city tour bus model to create network covering 30 cities in ten European countries. 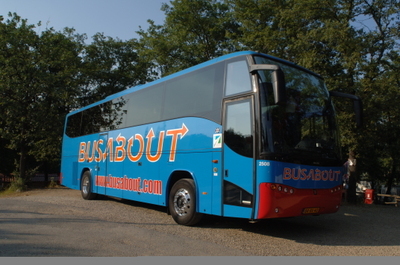 The cool part: Busabout has its own tour guides that travel with passengers on every bus. So before arriving at each city, they can tell you everything you need to know about that destination, as well as answer questions and give recommendations on where to stay, eat, etc. Once you arrive at your city, the exploration part is up to you, so you're never being dragged on any boring, stereotypical tours. The guides also have an extensive selection of the best accommodations in every city of hostels, budget hotels, and camping villages, all based on Busabout passenger recommendations, so it takes the guesswork out of finding a decent (and affordable) place to stay. Neat technology: Every Busabout guide carries a handheld computer that has a seat- and bed-booking system. This means that travelers never need to search a city for a cheap Internet café to book the next part of their trip. Every passenger also gets a Busabout Travel Pass, a card which holds your personal details, a full itinerary and other useful information, and is swiped through the handheld computer so that someone in the world knows where you are (worrisome parents, perhaps?). The best part: Trip options are split into loops, the Northern Loop (like Amsterdam, Berlin, Prague, and Munich), Southern Loop (think Venice, Rome, Florence, and Nice), and Western Loop (to Paris, Nice, Avignon, Barcelona, Madrid, Bordeaux, and beyond). Travelers can stay for as many days as they like in each city, and the Busabout buses stop in every city once every two days, making travel easy. Busabout also encourages sustainable tourism, and is part of The Leading Travel Companies of the World Conservation Foundation (which is always a plus in our books). The pretty penny: Loop passes start at $639 for one loop. The Flexitrip pass costs $549 for six stops along any of the three loops, plus $59 for each additional "hop." Getting the Shot: I used a Canon EOS 30D digital camera for this high dynamic range (HDR) image. Details: I was in St. Petersburg, Russia, for work when I walked over to this bridge, not far from my hotel room, on a foggy morning. 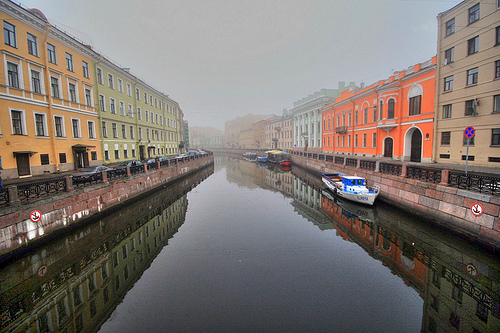 The river was so peaceful and the colors of the amazingly beautiful buildings seemed to really stand out in the fog. St. Petersburg is a fascinating city with so much to see and do. We like the way the bright colors bounce off the gray water. Think you've got a picture with a story to tell? Submit your best photos to our Flickr pool. 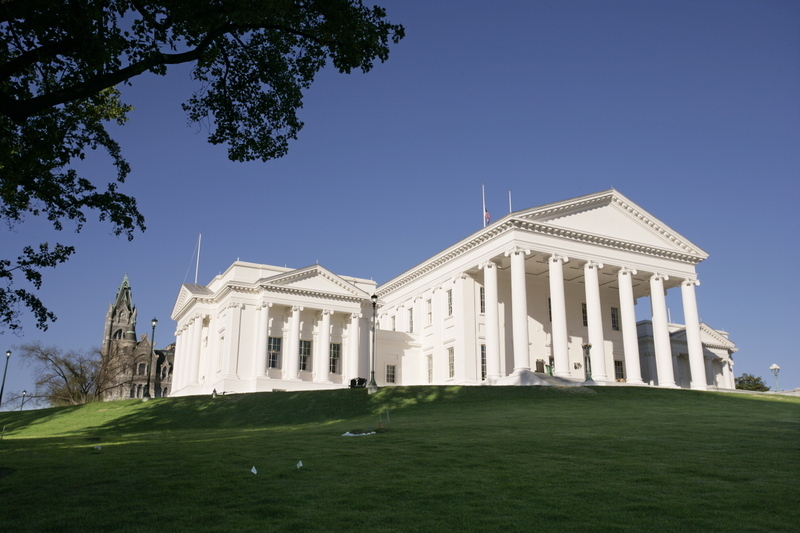 The Department of the Interior recently released the Tentative List of 14 U.S. sites that are "eligible to be considered for nomination" for a UNESCO World Heritage title (so they are nominees for being nominated, so to speak). It's about time: It's been a quarter of a century since the U.S. updated their Tentative List. These sites are eligible to join the existing list of eight cultural (like the Statue of Liberty) and 12 natural (Great Smoky Mountains National Park, Everglades National Park) U.S. sites (for a list of other tentative sites around the world, click here). Unfortunately, we might not know exactly which of these will become World Heritage sites for another 10 years — that's how long it can take to be considered and approved as a World Heritage nominee. 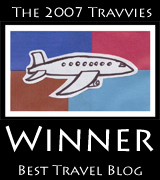 Which sites do you think are worthy of nomination? Living here in Washington, D.C., where transportation officials just upped the subway fares, it's nice to know at least one (more expensive) city across the pond has a cheap underground alternative. 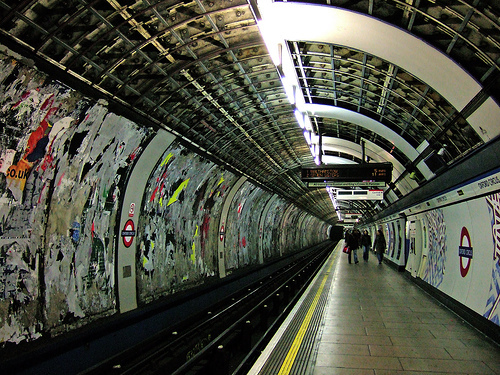 For example, a trip from Kew Gardens to Oxford Circus normally costs £4 when paying with cash, but for Oyster card holders, the trip only costs £2 (£2.50 from 7 a.m. to 7 p.m. Monday-Friday). Kids under 16 would only have to pay £.50 (£2 without Oyster)! Oyster cards can store up to £90 and can be used to access the Tube, buses, trams, the new Overground, DLR, and even some of London's National Rail services. There is an initial fee for an Oyster card (£3 for residents, £2 for visitors), but it's definitely worth it for visitors and residents alike, especially given the weak U.S. dollar that's worth only about £.50. Thanks to EuroCheapo for the tip! Traveler's Associate Editor Amy Alipio offers up some city-licious links and other news from the City Life team. Get Some Dim Sum: At least, while you still can. 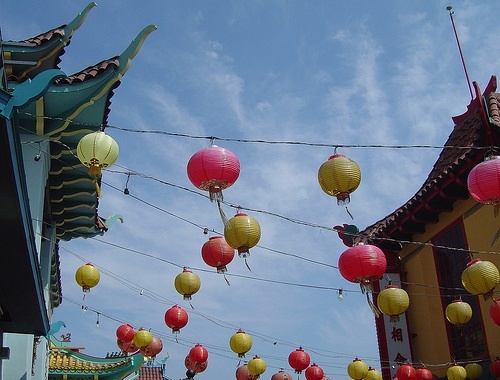 Check out Andrew Evans' interesting post on Gridskipper.com about the gentrification of Chinatowns, Washington’s in particular. Map it Out: We like superfuture’s cool maps for cities around the world, with shops and eateries pinpointed in colorful, easy-to-read fashion, like this map of London’s Soho. Cupcake Love: We don’t know about other city lovers, but we at City Life are out of our minds for cupcakes. Which is why we stepped up our workout program when we read that Beverly Hills-based Sprinkles is looking to open an outpost in D.C., one of 16 cities soon to be graced with the confectioner's cakes. For City Lifers in Phoenix, Sprinkles is set to open at 4501 North Scottsdale Road this month. Photographer: Sonya Brewer of Peoria, Arizona (grew up mostly in California and has lived in Canada as well as Japan for four years). Getting the Shot: In November 2006, I traveled to Israel with my church. At the time I only had a point and shoot Kodak DX4330. The Details: We had just gone to the Mount of Olives that morning and were walking down the roads of Jerusalem. As we started down the narrow road of the Via Dolorosa, to my delight was a street vendor selling olives. 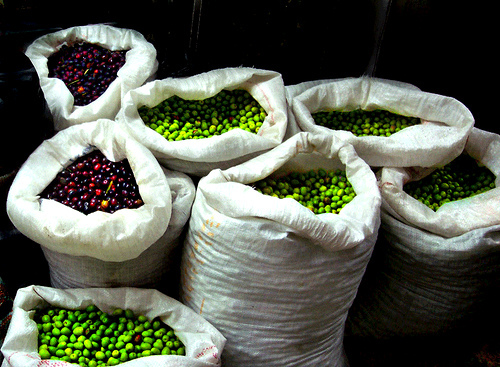 The colors caught my eye, as freshly picked olives filled the bright white bags. IT likes the way the olive bags billow larger than life in this shot. Want your own photos featured on IT? Add them to our Flickr pool. Travel to Vienna wouldn't be complete without seeing an opera. But how to see one on a tight budget? I just learned how to get tickets to a world-class show, without giving up my right arm. 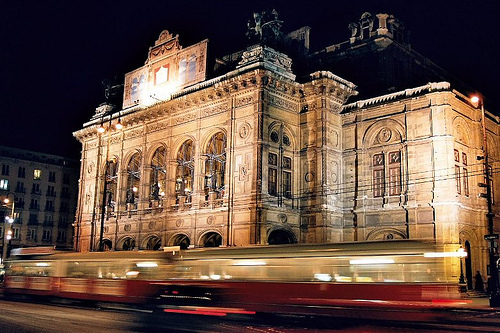 The Vienna State Opera (pictured, above), the oldest German-speaking theatrical venue in Europe, has a variety of options to please the budget traveler. Between 25 and 100 tickets are reserved for every show for children under 14. Children's tickets sell for €15 (about $22) for a seat anywhere in the house. Not bad for a parent who doesn't want to pay full price to watch their restless kid squirm during a three-hour opera! The State Opera's box office opens 80 minutes prior to each show. If you've got willing legs, get in line early to score standing room-only ("Stehplätze" on the seating chart) tickets for a mere €2-3.50 (about $2.90-5.00). Or bring binoculars and plenty of tissues and grab a seat in the nosebleed section. Balcony and gallery (balkon and galerie) tickets sell for only €7-18 (about $10-26). This is quite a steal, in my opinion. My legs would definitely appreciate the extra €3.50 spent on a seat! Thanks for the tips, EuroCheapo! A self-described "passionate yet lazy environmentalist" Josh Dorfman, radio host, environmental entrepreneur, author, and speaker, is anything but lazy. 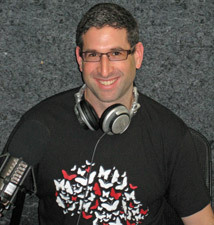 Since starting his satellite radio show, The Lazy Environmentalist, Josh has interviewed people ranging from celebrities to magazine editors highlighting green living, sustainable travel, and more. What inspired you to start the Lazy Environmentalist? I felt that a voice was missing from the environmental movement that embraced the realities of our consumption society and instead of guilt-tripping and preaching, strived to make green living fun, attractive, and super convenient. As much as so many of us care about the planet, leading environmentally responsible lives is not always top priority. There’s our careers to attend to, our kids’ soccer practice, and millions of other aspects to our frenetic lives that make going green challenging. My aim is to constantly inform about green choices that actually make our lives better, so that going green becomes something we want to do instead of something we feel compelled to do. In what ways have your own habits changed since starting your radio show? Are you still lazy? I’m definitely still lazy, which is why I want green solutions that don’t require me to change my habits. But if changing my habits is required, then I want green options that are cool or save me money or make me healthier. I’m more apt to go green if it’s in my enlightened self-interest – that is, it’s better for the planet and it’s also better for me. “Sacrifice Environmentalism” is a really lousy brand marketing concept. We need smarter thinking, more innovation. Do you have any examples of innovative ideas that seem to work for you? I’ve been sampling reusable bags from Envirosax and Flip and Tumble and Angry Little Girls (I love this one). I’m more apt to change my behavior and bring a reusable shopping bag with me to the store if the bag is stylish, convenient, and/or funny. Think about the Toyota Prius. People buy it partly because it saves them money at the pump and it’s better for the environment. But people mostly buy it because they know that when they’re driving it, everyone else on the road sees what a wonderful, enlightened, hero of the planet they are. We need more solutions like that. Relying upon people to “do the right thing” is a losing proposition. Engage people and let them feel really conspicuously good about going green and we’ll get some results. I know a lot of people take issue with me on this, but the question we have to ask ourselves is: Do we want to feel righteous or do we want to be effective? I prefer trying to be effective. In the March issue of Traveler, writer Taras Grescoe reveals how to enjoy Paris's tradition-steeped pleasures like a local in the cover story, "Authentic Paris." David Downie, an expat based in Paris since 1986 and author of Paris, Paris: Journey into the City of Light, suggests elevating your stroll. Extending east from the Bastille 4.5 km to the Bois de Vincennes, the Promenade Plantée is a defunct railway viaduct turned linear park that guides walkers above the traffic. Framed with a pleasant landscape of cherry trees, maples, roses, and more, the path offers a quiet respite and unique vantage perfect for ogling pretty architectural details and the busy cityscape below. Stone stairways lead down to small parks and arcades filled with craft stalls. The Promenade Plantée is said to be the only park of its kind in the world, though a similar project is currently in the works on Manhattan's West Side. Check out more photographs by Catherine Karnow here and in the March issue of Traveler, now on newsstands. 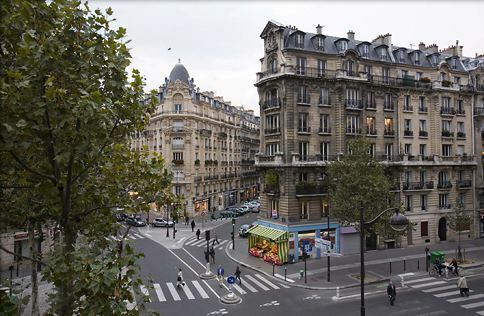 Continuing our Paris theme this week, Traveler's A*List newsletter has uncovered a five-day, four-night Paris package from Tourcrafters with round-trip airfare from JFK or Boston starting at $545, including daily breakfast. This is a February deal, and the price will increase to $620 per person on March 1, which will be good until March 13. Sign up for our A*List e-mail newsletter here. In America new was always better than old; in Paris old was always better than new. In the New World big was always better than small; in Paris there was a quiet celebration of all things small. In the New World time was of the essence; but in Paris life was of the essence—one should rush through absolutely nothing, most particularly lunch. Places of a Lifetime: Paris gives you Traveler's experts' picks for the best places to see, stay, dine, shop, and find entertainment, as well as books, music, and films to put you in the mood before you go. 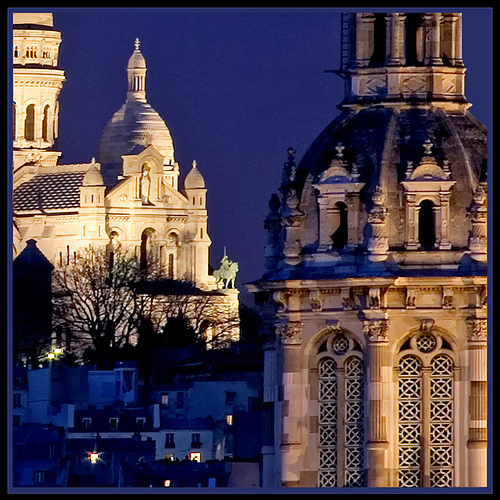 A*List extra: a downloadable map and walking tour of the Parisian islands in the Seine, the elegant Île St.-Louis and the more bustling Île de la Cité (Notre-Dame and more). Photo: Rita Crane at www.ritacranestudio.com via Flickr.